The foot of a person with edema. Keeping the legs elevated may help treat leg edema. 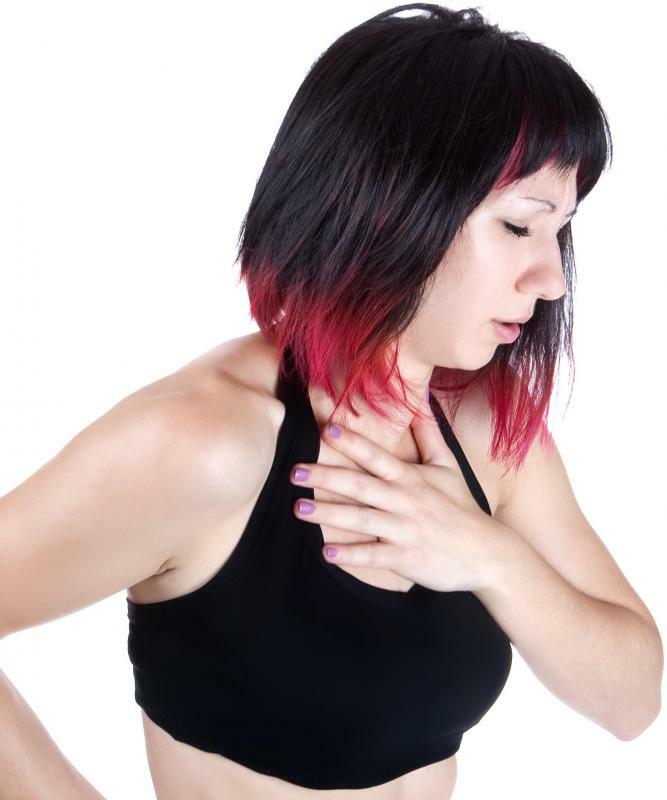 Pulmonary edema is usually caused by heart failure. Cutting back on salt may help relieve edema. 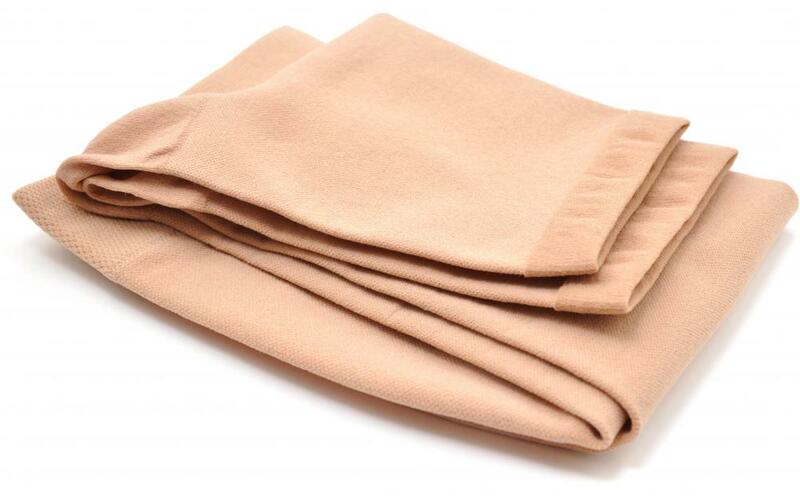 Compression stockings may help prevent fluid from collecting in the lower extremities. 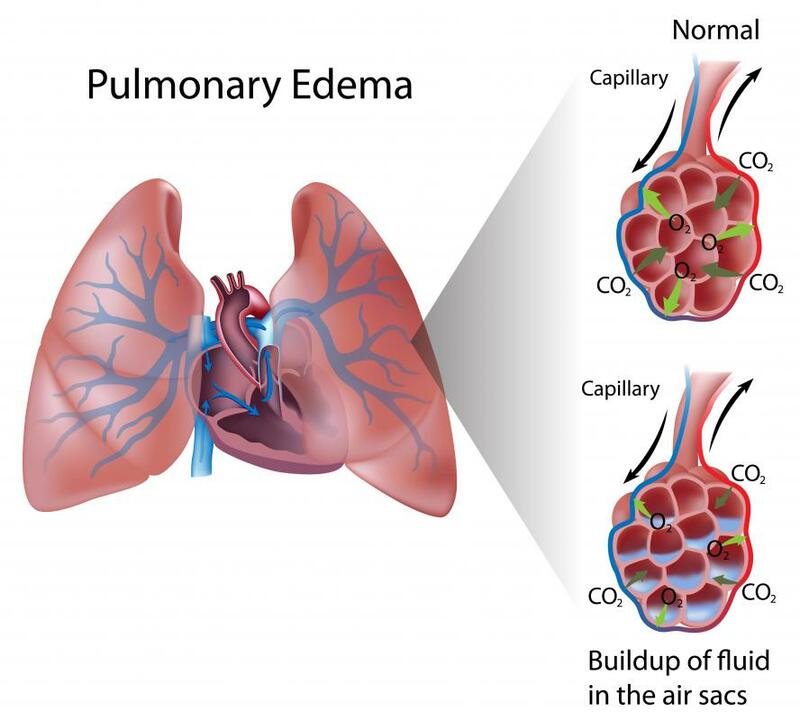 Pulmonary edema refers to a medical condition characterized by the build up of fluid around the lungs. 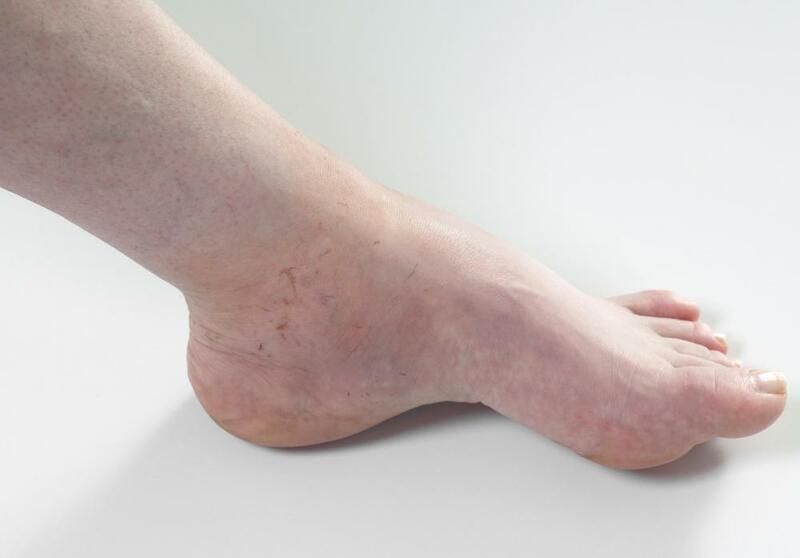 Edema is the accumulation of fluid in bodily tissues or a body cavity. The word is derived from the Middle English word ydema, which comes from the Greek word for "swelling." In people who suffer from this condition, the swelling is usually clearly visible. Most commonly found in the feet and legs, fluid accumulates beneath the skin in the spaces within the body tissues outside of the blood vessels, called interstitial spaces or compartments. Most often a result of diseases of the liver, heart, and kidneys, edema is directly caused by salt retention. Besides the legs and feet, other main areas where fluid can build up include the lungs (alveoli), the abdomen or peritoneal cavity, and the chest. When it occurs in the lungs, it is called pulmonary edema and is usually caused by heart failure. 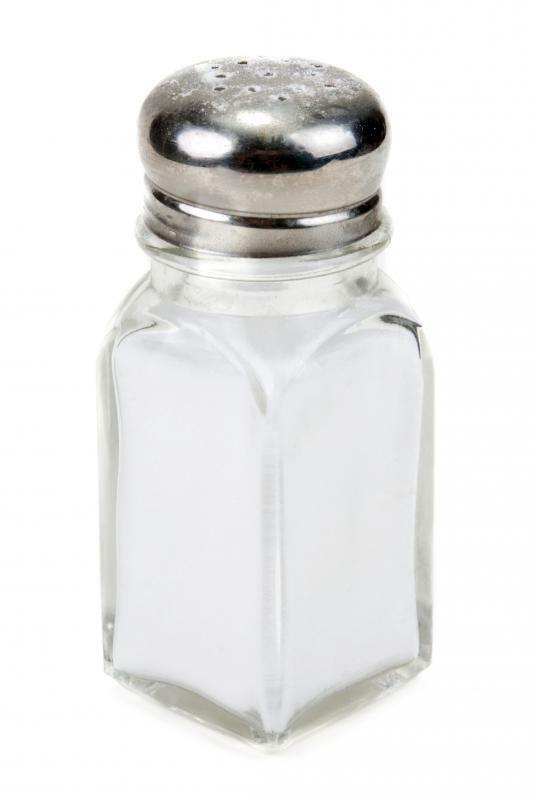 Most people can consume a large amount of salt without having any problems, but those with underlying disease may not be able to process and eliminate the excess. People with heart disease experience a reduced flow of blood to their kidneys, which then affects the kidneys' ability to eliminate salt. This leads to the retention of fluid, and possibly edema. There are two types — pitting and non-pitting — and knowing which kind a person has can help a medical professional diagnose the cause. With pitting edema, the swollen area shows indentations when it's touched, and may hold the lines from the socks or stockings. The non-pitting type does not retain an indentation and is often seen in people with lymphatic system problems or hypothyroidism. Idiopathic edema is a type of pitting edema that occurs without any obvious underlying disease or condition. It is most often seen in women, who experience it in the legs and feet when they are pre-menopausal or pre-menstrual. The condition is sometimes known as cyclical edema. Besides treating the underlying condition, medical professionals often recommend diuretics and reduction of salt intake to treat the swelling itself. What is the Connection Between Blood Pressure and Edema? Yesterday, I woke up with swollen eyes but after some time the swelling disappeared. Yesterday I woke up with one side of the face really swollen. Today my upper part of the head looks swollen but when you massage it, the swelling disappears immediately. I woke up with a cut and five bumps on my right heel that hurt. Any information? I've been using Bonvolant compression socks to help alleviate the edema in my feet. The swelling did reduce and my leg no longer feels uncomfortable. I guess that compression socks do help to improve the circulation of blood and lymph. If not, water will accumulate in legs or feet. I was born with a hole in my heart -- Ventricular Septal Defect is what it's called. It was a fairly big hole when I was born, and it has decreased in size but not much. I have that whole bluish nail beds and extremities and stuff and am scared that I might need to go to the doc to get checked out. Also, I was recently diagnosed with pleurisy and was told that it can be caused by heart defects and such and was wondering if anyone can tell me anything. Maybe someone else has a similar situation? I have a problem and I need some help. On one side of my body -- my left side -- I have swelling and the left side of my face is swollen too. I have had all the tests that I think the doctors can do and know also I have been losing my voice and and then it comes and goes. Also, my mouth is getting really sensitive to anything, even mayo. That is really surprising me. And I could be sitting here and try to swallow and it is hard and getting scary, too. If anybody can help with that, I would appreciate it. I personally have this, and I have swelling that is not related to any other known issues other than I am very sensitive to salt and retain fluid easily. If I drink even one 12-ounce can of Pepsi (which has the lowest sodium of almost any regular cola product), I will have swollen ankles. come with more than enough already. It also helps if I keep my feet up, especially at night. I sleep with a small pillow under my ankles. I found that after about five or six days of not adding any salts, eating no fast foods whatsoever, drinking only water and unsweetened tea, the swelling subsides, my wounds scab over and heal, my ankles return to a size I didn't believe they would ever be again, and best yet, all my cute sandals and heels fit again. This is what works for me, so see if it helps for you, but please do still see a doctor if you haven't already. My face gets puffy looking some days. I don't know if it's edema. I really don't know what it is. Then on other days, it's not and my face looks good. I thought it was salt or something but like two years ago, I could eat anything and my face would be the same. I really don't know what the problem is. Please help. I have been dealing with swelling of my legs below my knees and into my ankles. the swelling usually stops at the top of my socks. I have noticed when i drive long distances or i am on my feet a lot during a day or week, my legs will swell a lot. i can push in with my finger just inside my shin and it will create a large dimple that will stay for a minute or so. this has caused my feet and ankles to ache and makes it hard to walk after sitting for a while. Also it makes my shins tender. what can i do? travel and that seems to help some. my job requires me to be on my feet a lot walking on concrete through out the day. currently that is only 10 hrs x 4 days but at times i will be required to work 80 hours a week during our busy times. I sure wish I could find out more. First day I woke up with swollen hands. Second day I woke up with swollen feet. I'm on my third day and just woke up with swollen lips/face. My doctor ran some tests yesterday and told me he doesn't know what could cause this. I have been drinking a lot of lo-carb Monster energy drinks lately and I read a few edema articles that were related to energy drinks. I will stop drinking those and see what happens. This is quite scary. I wore Vans' KVDs to accommodate my brace. It worked, but my feet swelled up like a Ball Park hot dog. I'm now going back to my New Balances, even though I can't strap them shut. How can you know if the dosage prescribed for lasix (a furosemide - not the laser eye surgery) for the treatment of edema (water retention in the lungs) would not result in dehydration? I was wondering if pitting edema can be caused by a past injury. My sister got into an accident about 7 years ago and broke her leg. Lately the area where the bone was broken is red and swollen with pitting edema. I wanted to know if this is something to be concerned about. She doesn't have the money to go to the doctor and I am worried that it may be serious. Any information would be greatly appreciated.